Mr. Schinas holds an MSc on Public Administration and Public Policy from the London School of Economics, a Diploma of Advanced European Studies on European Administrative Studies from the College of Europe in Bruges and a Degree in Law from the Aristotelean University of Thessaloniki. Mr. Schinas has worked for the European Commission since 1990 in various positions of responsibility mainly in the private offices of Commissioners. He also served as Head of Press and Information in the Commission Representation in Greece (1994-99). From June 2004 to September 2007, he served as the Head of Cabinet to the first EU Commissioner of Cyprus, Mr. Markos Kyprianou, responsible for Public Health, Consumer Protection and Food Safety. Mr. Schinas was elected Member of the European Parliament in September 2007 and was full Member of the Budgets Committee, Member of the EU-Turkey Joint Parliamentary Delegation and alternate Member of the Committee on Economic and Monetary Affairs. 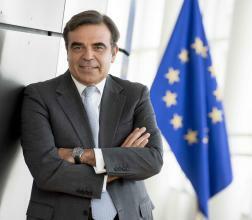 Upon the completion of his parliamentary term of office, Mr. Schinas returned to the Commission and as of February 2010 was appointed by President Barroso as Deputy Head of the Bureau of European Policy Advisers, ranked at Director level. Since May 2013 to date, Mr. Schinas served as Resident Director, Head of DG ECFIN Athens Office, in charge of the on the ground teams (Task Force for Greece and MoU compliance) responsible for the Greek Economic Programme.